New South Wales Index of Deceased Estate Files 1923-1958 - Sarah Ann Pearson. Lived for 50 years in the Village of Wongarbon, New South Wales, Australia. Sarah Ann Pearson's Headstone has an incorrect date of death, it should read 23 Oct 1931. The report of Sarah Ann Pearson (n. Thorley) death was published in The Gilgandra Weekly and Castlereagh Newspaper, Thursday 29 October 193, Page 6. Sarah Ann Pearson's (n. Thorley) death was reported in The Dubbo Liberal and Macquarie Advocate Newspaper, Saturday 31 October 1931, Page 4. Sarah Ann Pearson (n. Thorley) Died 1931, Dubbo, New South Wales, Australia. Reg year 1931, Reg Number 19268. Sarah Ann Pearson's Obituary was published in the Dubbo Liberal and Macquarie Advocate Newspaper, Saturday 24 October 1931, Page 3. Laying side by side at the Wongarbon Cemetery, in their family grave are; John Pearson,Sarah Ann Pearson (n. Thorley), Reuben Pearson, Gladys McKelvey, Thomas McKelvery, Leslie Pearson, Ambrose Pearson, Albert Pearson and George Pearson. Wongabong Cemetery, Wongabong, New South Wales. 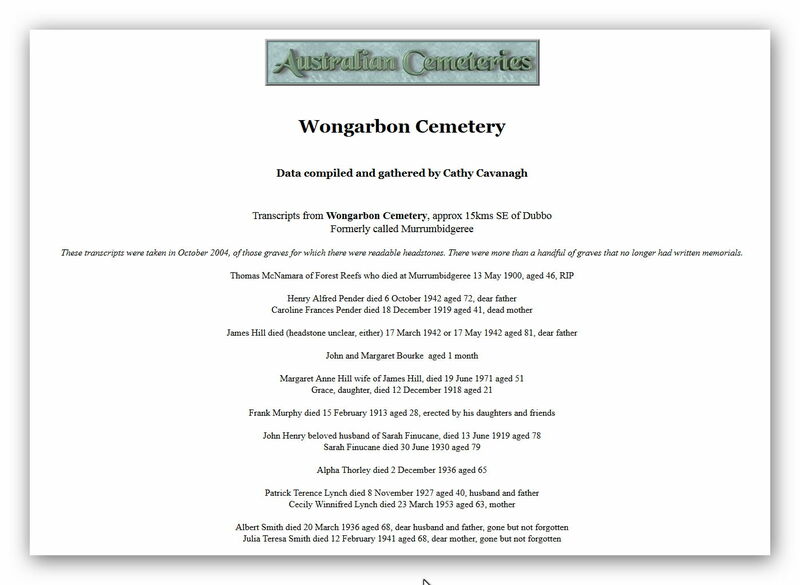 Wongarbon General Cemetery is located on Veech's Road Wongarbon. The Village of Wongarbon is on the Mitchell Highway 18kms east of Dubbo, New South Wales. From the highway, turn into the village, cross the railway line, then turn immediately left at the "Cemetery" Sign. After 400m, turn right into Veech's road from where it is 3km to the cemetery gate on the right side of the road. John Pearson and Sarah Ann Thorley Married 1868 at Cassilis, New South Wales, Australia. Registration Year 1868, Registration Number 2038. [S4] NSW BDM, New South Wales Government (Reliability: 2), 1847. [S290] New South Wales, Index of Deceased Estate files 1923-1958, No. 63777 (Reliability: 3), 23 Oct 1931. See attached copy of index file. [S281] The Dubbo Liberal and Macquarie Advocate Newspaper, 3 (Reliability: 3), 24 Oct 1931. See attached Obituary of Sarah Ann Pearson. [S4] NSW BDM, New South Wales Government (Reliability: 3), 1931. [S101] Headstone Inscription (Reliability: 2), 20 Oct 1932. [S289] New South Wales, Index to deceased Estate Files 1923-1958, No.63777 (Reliability: 3), 23 Oct 1931. Date of Death 23 Oct 1931 - attached copy of Index card 63777 Sarah Ann Pearson. [S152] John Griffiths (Reliability: 2), 23 Oct 1931. Sarah Ann Pearson (n. Thorley) died 23 Oct 1931 Wongarbon, New South Wales, Australia. See attached Obituary published The Dubbo liberal and Macquarie Advocate Saturday 24 October 1931. [S281] The Dubbo Liberal and Macquarie Advocate Newspaper, 4 (Reliability: 3), 31 Oct 1931. [S280] Wellington Times Newspaper, 4 (Reliability: 3), 29 Oct 1931. Report of death of Sarah Ann Pearson (n. Thorley), published in the Wellington Times Newspaper, Thursday 29 October 1931, page 4. [S280] Wellington Times Newspaper, 5 (Reliability: 3), 29 Oct 1931. [HEADSTONE] (Reliability: 3), 20 Oct 1932. Sarah Ann Pearson's Headstone located at the Wongarbon Cemetery, approx 15kms SE of Dubbo. See attached Photograph. "The Funeral will take place this afternoon, at 2 o'clock, from her late residence to the Wongarbon cemetery where the mortal remains will be laid to rest in the church of England Portion." Report of death and Funeral of Sarah Ann Pearson (n. Thorley) that was published in Wellington Times Newspaper Thursday 29 October 1931. [S152] John Griffiths (Reliability: 2), 20 Jun 1868. Sarah Ann Thorley married John Pearson 20 June 1868 at School House, Cassilis, New South Wales, Australia.